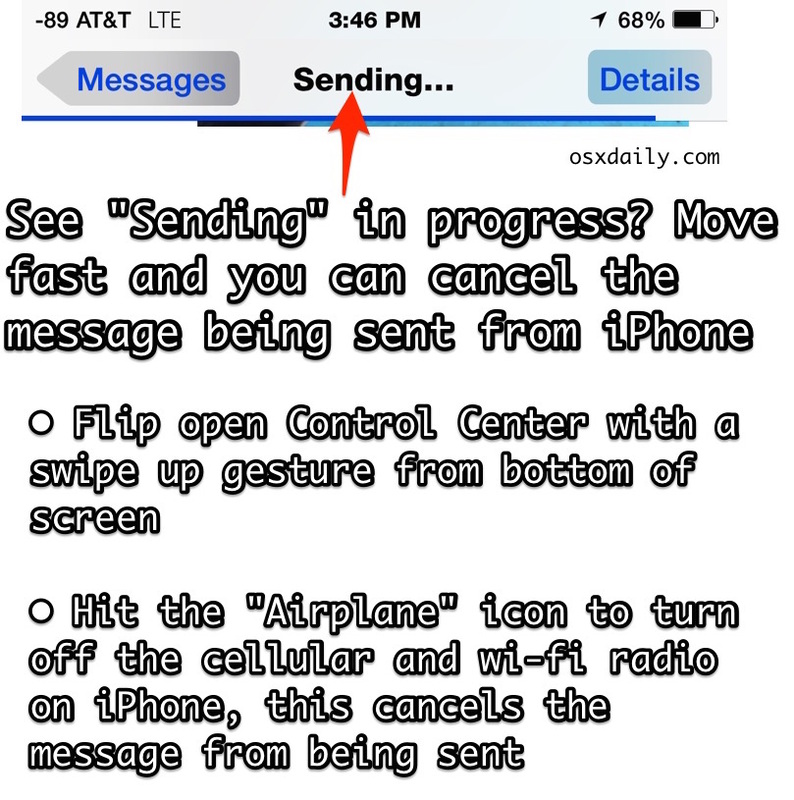 If you’ve ever hit “Send” on an iMessage or text message that you wish you could take back, or perhaps you’d just like to cancel a sent picture because it’s stuck on ‘Sending’ and taking forever to send the message due to a congested network connection, then you may find this iPhone “cancel send” trick to be handy. To be clear, this is very much a trick, because there’s no direct method to cancel sending a message from the iPhone, and it requires some quick action on the users part. Nonetheless, it absolutely does actually stop a message from being sent if you are fast enough. The requirements for canceling a message from being sent are pretty straightforward: you can only cancel a message while it is attempting to be sent in progress. This is indicated in the Messages app by recipients name turning into “Sending…” text, and you’ll see a blue progress bar across the top of the screen. As long as “Sending…” is in progress and there is the blue progress bar visible, you can cancel sending the message, here’s how this works on iPhone (and iPad or other iOS devices too). If you see “Not Delivered” you know it worked. If the message says “Delivered”, or nothing, it probably sent. 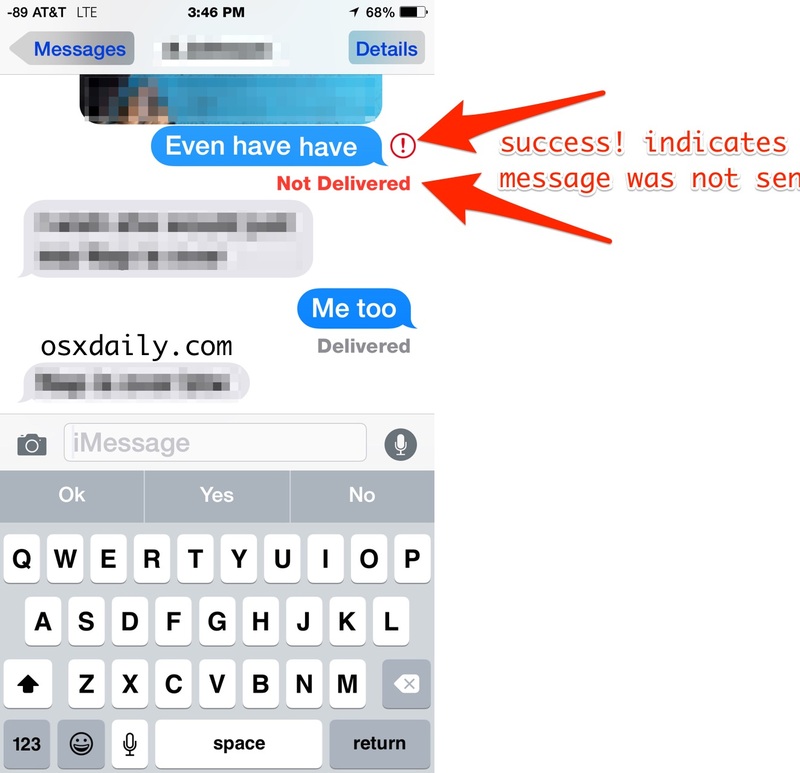 If the “Sending…” message and status bar is still visible, you did not complete the trick properly and you’ll need to try again. This works very well to cancel the sending of picture messages, audio messages, and video messages from an iPhone. It works less well and you have to be lightning speed to cancel a simple text message or iMessage of text, simply because the data size is smaller – with that said, if the network is slow or congested, or the reception is bad, usually even a simple message can be canceled using this same trick by quickly turning on the AirPlane mode switch. If you’re wondering why bother and what’s the point of stopping a message from being sent, the most obvious use case scenario is this; let’s say you are on a congested cellular network, a fairly common situation for most cities at peak usage hours. You go to send someone a picture message in the middle of a conversation with your new iPhone Plus, and the image is 6MB… so you tap send and, well, now you’re stuck on “Sending…” for the next foreseeable future, and you’re unable to continue messaging with that person because all of the next messages that are sent are backlogged behind that picture, so until that sent media message clears, none of the other messages will go through. I run into this fairly often in major cities, and despite the iPhone reception indicator showing things as fine, the network is so congested that sending a picture takes an eternity – in my case it was 45 minutes to send a 5MB image before it eventually failed to send anyway. If you find yourself in that situation, just use this AirPlane trick to stop the sending of the message, then re-send the message, picture, video, or audio messages, when you’re back on a reliable wi-fi network and not at the whims of whatever the local LTE network provides. Sure, you could also use this to cancel sending an embarrassing message sent to the wrong person, or to cancel sending a message where you put your foot in your mouth, but as mentioned, that works the best with multimedia messages. iMessage and text messages SMS are generally sent very fast, and there is usually a very short delay in sending since the transmission size is so small, so you’d either need to be super lightning fast or just live with the sent message. For now, this is the only trick that is known to work to stop sending a message from an iPhone or iPad, and it probably works on an Android too. Until there is an “Undo Send” button to stop or cancel a message being sent, which may never happen for a variety of reasons, this is it. 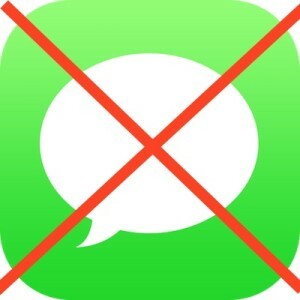 If you know of another way to cancel sending a message or to stop a message from being sent from the iPhone, do let us know in the comments. Or just turn your phone off. Ha yea I was going to recommend the same thing, I had an awkward situation once with a message and I just immediately turned off my iPhone and it worked to stop sending the message but it was a stressful few minutes. Turning it off would seem to be the most logical possibility however, when you turn the phone back on it sends anyway. I have tried that many times. Turning off the phone is not even an option, because it takes 3 seconds to just show the slider, while flight mode can be enabled in under 1 second. this article is stupid. this trick works for any phone on any base. if the message hasn’t actually sent yet you can cancel It on any phone. Actually this is not stupid and it works exactly as advertised. If you want to cancel sending a message, or any other data, you turn off the data transmission. It’s the only way to cancel sending a message. It doesn’t say ‘cancel a sent message’, of course you can’t undo what has already happened. This is not a time machine, it’s an iPhone. Read carefully. If you have a jailbroken device there is a app in Cydia to replace messages and it includes an unsend feature as well as delays so you can schedule texts to be sent and cancel them. I ran into this just yesterday. I tried quitting the app in hopes that would do it. I tried sending too large of an image. Thanks for the tip! And of course, once you have prevented the SMS from sending with this “trick”, you can tap the exclamation mark in a red circle icon, and choose to resend or abort. Good tip, for sure, but I doubt it’d be as effective as controlling your booze intake. Since imposing a strict weekly cap on drinking, my embarrassing SMS output declined exponentially. Add to that this airplane-mode reflex, brighter days may well be ahead. Good one! Another way, if it’s iMessage, is to hold the message for a sec until it shows ‘More’ and delete it – this only works while the it’s ‘Sending…’ and the blue bar is on and only if your network is slow as you’ll otherwise not have the time. You’ll know it worked if it doesn’t make that swish-message-sent sound. Have just had the issue arise and the airplane mode worked a treat. I want to know that if I turn my airplane mode off, the message will not continue to try to send. I do have the exclamation mark, so I know it hasn’t sent, so can I delete the msg now while in airplane mode and it’s gone forever? Just a note – have just tried the above, twice, by quickly sliding to airplane mode and although my phone said “not delivered” and had the red exclamation mark, it did actually send. Checked with the recipient, so this method is not foolproof! Turn the phone completely off and turn back on, worked for me. I’m out of the country with my ‘airplane mode’ continuously engaged and I’m staying in a house with WiFi. I received a text(iMessage from another iPhone) and am now trying to respond. The bar indicator is blue, so I know we’re both connected to the internet. 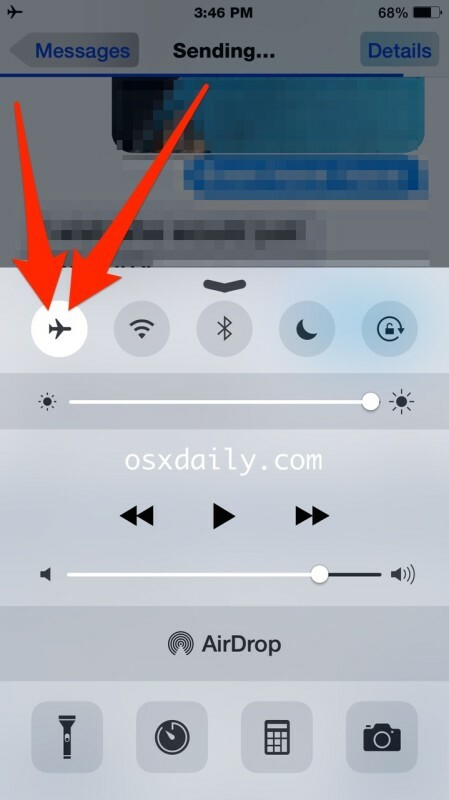 However, I do NOT want to turn off my airplane mode and then do this trick. Is there anything else I can do to cancel sending my [blue] iMessage? Help! I accidentally recorded and sent a voice text. I deleted it before it was played but a while later I see that it is still on my iPad! Was it still accessible to the person I sent it to??? Yeah, this either was never foolproof or it no longer works for iOS 9.2.1. I’ve had the “Sending…” message for a while and tried this to no avail. It’s still “Sending…”. I’ve also tried completely turning off my phone. After rebooting and re-opening iMessage and opening the thread, I see it’s still “Sending…”. It’s possible an Apple engineer thought they would be helpful and persists the “sent/sending” state in memory so that if the network/wifi/power disconnect, when it comes back up it just tries to “resume” sending where it left off (and apparently now has a reeeaaally long timeout before aborting) and/or my iMessage software is in a corrupt state. Either way, this is _not_ a universal fix, just FYI. Does any1 kno how 2 delete a pic on a friends text page? Somehow there r 4 copies of the same pg on her text screen that I would like 2 get rid of but cannot pull up a “delete” 2 get them off my phone. Help! If you insist on using all those abbreviated shortcuts instead of full wording, I’m just curious as to why you didn’t say “ne1 no”! I tried Unicorn’s idea above and just FYI, it deleted the entire thread of conversation with the person I was trying to send three photos to. That’s not the end of the world, but it’s not what I expected. I’m on my home wi-fi network and trying to send three studied photos to someone and they won’t send. They’re just stuck. It’s happened before and I don’t get it. It seems like an iPhone 6 on wi-fi should not be overwhelmed by sending three photos at once. Sure would like to know if there’s a way to retrieve a text message accidentally sent to the wrong person. I doubt there is, but ???? You can cancel sending a message using the tricks described here, but it must be sending actively or have not been sent yet. That is why it requires quick action. But aside from that no you can not unsend a message after it has been received by a recipient. Yesterday I was at an airshow, standing in the middle of the airport far from any Wi-Fi, but had solid LTE. I was exchanging messages and photos with people for about an hour with no trouble (fast service). Suddenly a couple of messages to different people (simple text, not large photo) got “stuck” – that is the blue progress bar never got to the right edge. I waited a while and then received more messages from those people and others, so I simply continued the conversations with no problem, despite the fact that the progress bar for two people remained stuck. Over the next 24 hours I moved between various Wi-Fi networks and had no other problems, but those progress bars remained stuck. After some research I found this thread and turned on airplane mode. The one progress bar I was watching actually changed from blue to green, but otherwise didn’t move. After 2 minutes I turned airplane mode off, and both of the stuck progress bars had disappeared. What if I delete a chat before the blue had reached . Would it still send ?